Traditional journalism supposed a writer who could stand apart from her subject, observe it, investigate it, and write down those observations for others, all while disregarding her own personal biases and remaining unaffected by the experience. The resulting work was free of emotions, passions, ideologies, or beliefs. The journalist in fact barely even has beliefs, or at least not publicly. She embodies the secular ideal: free of bias, open to everything that is logical and factual and verifiable. This convenient fiction reflects well on us as readers, too, which might be one reason we continue to believe it. The reader who leisurely peruses the morning paper over coffee (or hurriedly scans it in the subway) might also imagine he is measuredly reading both sides of the story and making up his own mind about the issues of the day, while still remaining fair-minded and intellectually honest. This is a holdover from an earlier time, before postmodernism scraped away the veener of objectivity. Journalists are people, too. Like everyone, they are subject to bias, conscious or not. Academic journalism itself has grown suspicious of the objectivity myth. But it's still appealing, because it makes us feel civilized. An objective journalism would quiet the notion that things like beliefs have to color how we look at the world. It would prove that it is possible to fence in a "secular" public square, one in which religion and bias are checked at the door. 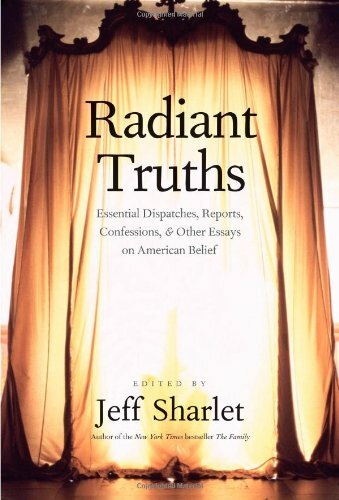 In his introduction to Radiant Truths, Jeff Sharlet goes further: he writes that the very idea—"the belief that it is possible to stand apart from the world—cuts close to the more obviously religious doctrine of infallibility" (14), which is to say that even this belief in a non-sectarian secular space is its own sort of religion, something based more on faith than empirically verifiable fact, something that is profoundly identity-shaping for its believers. In this volume, Sharlet, a self-described skeptic who is a bestselling literary journalist and a professor of creative nonfiction at Dartmouth College, pulls together a valuable trove of the best of the genre that helped break down conventional journalism's claims: literary journalism, and, specifically, reporting on American religion, ranging over the past century and a half. Well-known multi-genre writers (Henry David Thoreau, Zora Neale Hurston, Mary McCarthy, James Baldwin) appear alongside more niche practitioners (Meridel Le Sueur, Ellen Willis), with work that covers a stylistic range from the clinical to the barn-burning. Literary journalism crops up in the mid-nineteenth century—the collection begins with Walt Whitman in 1863—but doesn't get a toehold on the American journalistic landscape until the mid-twentieth century, when practitioners like Tom Wolfe, Joan Didion, and Norman Mailer made their careers writing it. Novelists flock to the genre, since its techniques are closely related: nearly all of David Foster Wallace's nonfiction is literary journalism; Zadie Smith has done her fair share. You can read literary journalism in many vaunted publications, from books and elder statesmen like The New Yorker and Harper's to upstarts: n+1, The Believer, websites that come and go. The public radio show This American Life functionally practices the genre in radio form and launched a revolution in radio. Literary journalism appears in major newspapers and magazines alongside traditional reporting, too—Ta-Nehisi Coates's much-buzzed-about 2014 article on reparations in The Atlantic qualifies; The New York Times Magazine frequently publishes long-form literary journalism by important young writers like John Jeremiah Sullivan. All of this is part of a wider shift toward what the academy calls "creative nonfiction," a genre that also encompasses memoir, personal essay, some forms of criticism, and other less definable works. That is a messy, confusing family, but all creative nonfiction has a couple things in common: a noticeable narrator who has made choices to enter and shape the story (and often uses the first-person pronoun), and a story is built out of things that happened in the same universe the reader occupies. Nearly everything else is up for grabs. As part of this tradition, writers of literary journalism are cognizant of their own participation in their stories, as well as the power they hold to shape the reader's perceptions of their subjects. It's difficult to be even-handed in covering things that often, frankly, test the limits of the writer's credulity. So necessary is the continued suspension of judgment that the writer sometimes finds himself adrift, not sure what even he believes anymore. In Radiant Truths, Sharlet "looked for pieces that 'essay' these contradictions, true tales that recognize that the wrinkle in any truth is always the truth teller herself, essays that attempt to become documents and take stock of their failures to completely do so as an inevitable part of the story" (6). He is convinced that literary journalism is "uniquely well suited to the documentation and representation of the strange category of American religion" (9). That is because literary journalism (like all creative nonfiction) is a genre of border-crossing, in which the individual writer enters a world and writes as both part of it and as the other. It requires the writer (in Charles Taylor's terms) to maintain a bounded and a porous self at the same time—not too easily drawn in, but also open to the idea that something beyond the material world is going on before her eyes. Good literary journalism requires walking a very thin rail between both skepticism and empathy. The writer can't reflexively sneer at his subject, but he can't be swept away, either. Sharlet himself knows that it's a very live possibility—in the essay "Heartland, Kansas," which Sharlet and Peter Manseau wrote about the Fort Riley Dark Moon Coven Association, they find themselves participating in the rituals, too: "A couple of skeptics made to dance like holy fools. If that wasn't magick, it was a hell of a trick" (346). Radiant Truths defines the word "religion" broadly enough to encompass not just traditional forms of institutionalized belief, but the more nebulous, amorphic, individualized spirituality that seems to thrive in the swampy pluralism that is America, a country that both prides itself on its root in the rationalist Enlightenment and its institutionalized heritage of religious freedom. When this strange hybrid form of literary journalism focuses its attention on religion, it turns out, it's a perfect match—as Sharlet puts it, "the impossibility of perfect representation of reality, visible and otherwise—makes literary journalism uniquely suited for the subject of American religion, so often struggling to be one or the other, pious or democratic, communal or individual, rooted or transcendent" (15). Which is all to say that literary religion journalism is, itself, a post-secular genre. It operates mostly outside any plausibility structures guided by one particular faith, but it also does not actively reject religion or ignore the existence of things beyond the writer. It does not presume that a "scientific" approach to the world—one which deals only in empirically verifiable "realities"—is the legitimate one for grown-ups, while considering religion as a nice hobby for some people to mess around with at home on the weekends. In its rigorous examination of the world, it slips past what we touch and see. When its practitioner is doing her job, this writing is frightening, mysterious, and unnerving. One gets the keen sense, from Sharlet's collection, that the best literary journalist is a doubter who wants to believe: the bounded rational skeptic whose heart betrays him at unexpected moments. This crops up over and over, particularly in the later essays in the book. In "Upon This Rock" (by my lights, one of the best creative nonfiction essays ever written), John Jeremiah Sullivan recounts his trip to the massive Creation music festival, where he expects to write up a cheeky bit of reporting for Rolling Stone but winds up encountering his own past in an evangelical youth group. Dennis Covington travels to West Virginia to write about snake handlers, and winds up handling. Ellen Willis goes to live among the Orthodox in Israel, where her brother has converted, to figure out why modern, progressive, educated people would join such a restrictive, seemingly backwards world; she is simultaneously attracted and repelled. Barbara Grizzutti Harrison, a Catholic who has some beef with the church, reports on World Youth Day in Denver and finds herself vacillating between appreciative and frustrated. Wiccans and occult lore, romantic naturalism and mystical voodoo, reform preachers and the Amish—all get a fair shake in this anthology, accompanied by Sharlet's incisive introductions. The harshest criticism is reserved for American Protestantism by Gary Wills, who visits Richard Nixon's hometown and unpacks the sort of mainline therapeutic deism in vogue at the time. It comes in for criticism precisely because it is not a religion that asks its adherents to open themselves to the possibility of the divine. After attending a Sunday morning service, Wills notes, "the congregation had not been summoned to accept Christ, but to accept itself. To accept itself accepting a world of sunny disorientation. The milky white center is reserved in these windows because they, the people, America's large blank center, are the object of their own cult" (206). In other words, the most problematic religion is one that eschews transcendence and finds its center in its adherents—according to Wills, it turns each one into his own self-made man, the "true American monster" (214). Yet the mythology of conventional journalism gave its readers reason to believe they could do just that: live an intelligent life, ignore the possibility of forces beyond themselves, and construct a progressive public square in which objectivity ruled and religion was relegated to something you did for fun when you went home. Literary journalism, by contrast—which Sharlet calls "the hybrid genre, the monster genre—half-report, half-story, half-ethnography, half-magic" (134)—fires back that no, there is no way for a world freed from religion to exist. Religion, or the search for something beyond ourselves, is not something we construct and toss away at will. It is rooted deep in us. It works on us in unexpected ways. It leaves us questioning our own powers of reasoning. It can leave us speechless in the face of the unexplainable. And it does it by forcing its writers, and therefore its readers, into an encounter that demands we loosen up our boundaries just a little—first to each other, and then to the mysteries that we believe in. Sharlet never comes out and says it, but he implicitly suggests in this collection that the porosity required of the writer, and then reader, of literary journalism may actually teach us how to wander toward a more robust pluralism, one that both requires the (always tenuous) acceptance of a multiplicity of beliefs and strikes a balance between the bounded and the porous: openness to others, while maintenaning one's own firmly-rooted perspective. Such a pluralism chips away at the secularism myth. And it gives us a lot of great journalism, too.